How did we teach (and learn) anatomy before we had super-markers to paint directly on horses' bodies? I believe that this clever technique was popularized by American clinician Susan Harris in the 1990s, or at least she was the first to make an educational project out of horse-painting. We've seen an expansion lately, in the art of painting on horses. 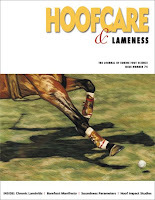 Dr. Gerd Heuschmann uses the horse as a canvas in his terrific video, If Horses Could Speak, and there's a beautiful new book on the Hoofcare & Lameness list (ordering info below) called How Your Horse Moves that documents painted horses going through gaits and stretches. The problem, of course, is that you can only suggest the surface structures, and so much lies beneath. And should you choose the skeleton or the muscles? Nicole Rossa solved that problem by painting the muscles on one side and the bones and joints on the other. Nicole is an equine therapist in England who has written some interesting papers, most notably one on asymmetry of the pelvis in racehorses and the effect on performance. Now she has teamed up with horse insurance company PetPlan and is consultant to the most ambitious web site project in the horse health world, Yourstables.co.uk. On second thought, don't click on that link. Yourstables.com is a distraction demon. It's an absolute vortex where hours can pass while you wander around inspecting the minute textures of the stable mats and what it says on the plaques of the walls in the office. You'll emerge hours later, blinking. Yourstables is a setup for teaching horsecare through consulting professionals, with the guidance of eventing legend Lucinda Green as an avatar. A 3-D horse barn (British style) is equipped with the newest and best of everything. You mouse over items and navigate through videos and printable articles explaining everything from grooming to diseases. It's quite good and Nicole Rossa is the consulting therapist. This list video is an out-take from a video made for the web site. Back to the painted ponies: I just have one question. Why stop with horses? Do dog health educators paint anatomy markers on greyhounds? Who wants to volunteer their Jack Russell or maybe a Pug to be anatomically decorated? Nicole Rossa might find some work on humans when Halloween comes around. 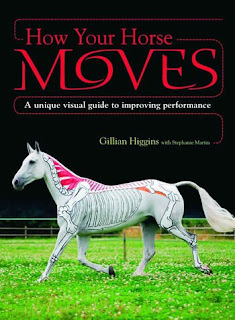 Heads up: How Your Horse Moves by Gillian Higgins can be ordered now. Super reference on anatomy, gaits, biomechanics, jumping, tendon function, back function, etc. All full color photography; most of the horses are anatomically enhanced and very nicely photographed. The cover does not do this book justice. Hardcover, 153 pages, indexed, 350 color photos. Intro by Chris Bartle and Bettina Hoy. I expect I will be seeing a lot of the photos in this book in other people's PowerPoints soon! The good news: $30 per book plus $6 per book post in USA, $13 per book elsewhere. 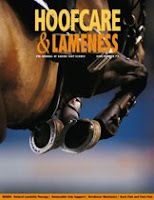 To order call 978 281 3222 or email books@hoofcare.com. NOTE: Gillian Higgins will be on the program at a conference with Dr Hilary Clayton February 13-14, 2010 in Grantham in Great Britain. A service for farrier Seamus Brady will be held on Saturday, August 1 at 10:30 a.m. at the Branchburg Funeral Home, 910 U.S.Highway 202 in South Branchburg, New Jersey. Calling hours will be Friday evening. Click here for details, or where to send flowers or leave a remembrance message. Seamus Brady, right, received a plaque from his longtime trainee/helper Phil Breault (standing) at the Wellington event. Phil organized the evening. That's Connecticut/Florida show circuit specialist George Fitzgerald on the left. I was in Dublin once, at the Irish Army Equitation School, touring with an American horseshoeing team. The young officer who was showing us around threw open the doors to the forge and as the sunlight flooded the space, he stood back and told me proudly, "This is where Seamus Brady learned the trade with John Boyne." "That was before he went to America," he added as an afterthought. He showed the same pride as would an Italian opening the door to the studio where Michaelangelo learned to paint. The fact that Doug Butler and Dave Duckett were standing next to me didn't seem to impress this rider at all. "Do you see much of Seamus in America, then?" he asked, as if Americans were all on just one show circuit neighborhood. 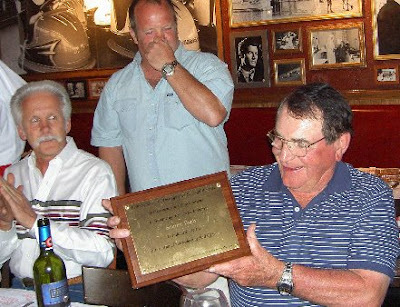 New Jersey/Florida-based Seamus Brady, the dean of US show-jumper shoers and possibly the most well-known farrier in his native land of Ireland as well, died yesterday. He was just a few months shy of 78 years old. The man needs no introduction in the farrier world. His name was a brand in itself, yet as far as I know, he never really had anything to sell except his services. His ideas traveled far and wide. But there is no Seamus Brady shoe, no Brady nail, no Brady pad, no Brady trademark or copyright or website. There are few articles or photographs, no books or dvds. I'm not sure that he ever joined any association except the informal show farriers group that gathered in Wellington, Florida on occasion. His only certification: his good name. There's quite a legacy. 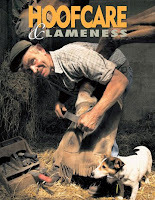 I can think of no farrier who influenced shoeing of real-world English-type show and sport horses more. He defined "the circuit". For farriers, he practically invented the circuit. 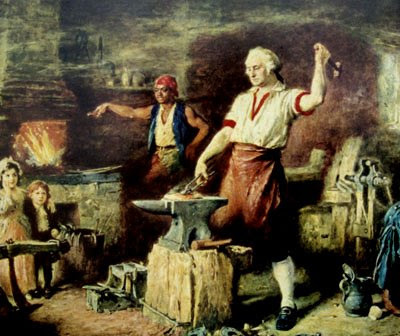 He may have influenced farriers on a professional level more than he influenced shoeing itself. 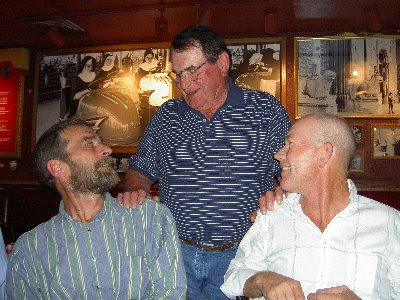 There have always been legends passed around the horse world about Seamus, great humorous tall tales about the Irish trickster who could weave great tales and present clients with the biggest invoices they'd ever seen. The legends preceded him around the world as he traveled with the US Equestrian Team to far-flung places like Seoul, Korea for the 1988 Olympics, where he kindly shared his experiences with Hoofcare & Lameness Journal, to out-of-context places like the Quarter Horse Congress, where we'd see him because he'd go to look at the new custom trucks. I expect that Seamus will become the Paul Bunyan of American horseshoeing. He's earned it: If half the people had been his apprentices who claim to have been, he would have had to have traveled in a bus, not a truck, all these years, just to carry all his apprentices. Every jumper show should fly its flag at half-mast this week. They couldn't have shown without his clever work on their horses and without the farriers he trained, inspired and called his friends. Exit an icon. Cue the storytellers. Complete these sentences: "I remember the time..."
"I've always heard that Seamus Brady used to..."
See what I mean? Seamus lives. Pass it on. And on and on. Don't stand too close!, originally uploaded by Lid Licker! 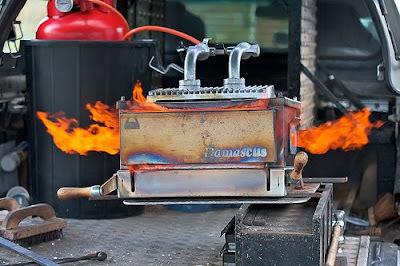 The wrath of Hephaestus Himself seems to be spewing from this Damascus forge put to its test at yesterday's Handmade Horseshoes farrier competition in Leighton Buzzard, England. Photographer Gary Huston has mounted a wonderful photo recording of the day on his Flickr photo gallery. Gary is a terrific farrier/photographer who knows where to point the camera and experiments with color saturation for unusual and remarkable effects. I'm a big fan of his and I bet you will be, too! For any non-farrier readers: this contraption is a propane forge used by farriers to heat steel for shoemaking or reshaping/altering of existing shoes. It works much like your gas grill but heats the steel quickly and efficiently to a very high heat so the steel is malleable. Working with one of these all day may be why farriers are such good hands at summer barbecues...and many of them are also great chefs, possibly because they have an innate understanding of the effects of heat on matter. Think about it. At this competition, farriers working in teams or alone would have been competing for perfection in craftmanship of a prescribed shoe design in a particular dimension from a supplied length, width and thickness of raw steel material. Think: Iron Chef with hammer and tongs. Realize: Hephestus lives, and he lives well. Out for a leisurely Sunday drive? Drivers in New York State are probably a little jittery today. It's Sunday, and there shouldn't be many trucks on the road. Yet the highways are jammed, and these big rigs aren't just any trucks. They're big air-ride trailers and horse vans of every size and shape, some carrying six or more horses each. It's Brook Ledge and Sallee Day on the Northway. The windows are down and you can see bay heads inside, nodding sleepily. And not just any horses: these are some of the best Thoroughbreds in the country. Hundreds of them are landing at airports and moving from training centers and tracks all over the US and Canada. It's an equine migration. A reverse diaspora. A gathering of the Thoroughbred clan. For these van drivers, all roads lead to Saratoga Springs, New York, where today is "open house" day for the locals, featuring some always-exciting jump racing. The betting windows open on Wednesday. And the stall doors are wide open to welcome the new arrivals. The vans will unload horses and just turn around and go get more. Today is the last day of racing at New York's Belmont Park so vets and farriers and exercise riders might have a few days off before things get going "up north", although some are already there working. The horses will skitter down the ramps and blink as they look around and see all the old shade trees, the painted-a-hundred-times wooden stables and the remains of the original racetrack from 1863. They'll notice immediately that this place doesn't look and smell like Long Island...and it's awfully quiet compared to the New York City tracks that crouch beneath expressways and airport landing patterns. That was a van ride back in time. This is a place where a colt can get some sleep. Where a filly can stretch her legs. Where a veteran campaigner's hives might clear up and a career might turn around. Where legends begin. So let's go back in time with the blog today, too. One of my favorite scenes from any horse-racing movie is the road scene from MGM's 1937 hit Thoroughbreds Don't Cry, which was the film that brought Mickey Rooney and Judy Garland together. You'll see a little bit of the road scene in this clip. Judy sings "Got a Pair of New Shoes" and, of course, I always like to think that the horse is singing along. This was probably also the first horsey-road-trip scene from a major motion picture, as well as one of the most musical. 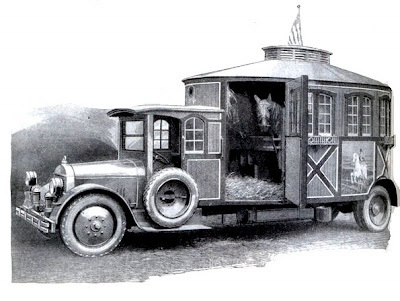 Horse vans and trailers were a relatively new thing. Timing is everything: This film was made in 1937, the year that War Admiral won the Kentucky Derby and Seabiscuit was rising to ever higher highs and lower lows out west. They would meet in their famous match race the following year. Also in 1937, Jean Harlow and Clark Gable made the horse-racing classic film Saratoga about New York's horseracing summer capital but Harlow became ill and died during the filming, though she was only 26 years old. The makers of Thoroughbreds Don't Cry couldn't have known what else would be going on that year or how famous their young stars would become. You can watch the whole film on YouTube or stream/order it through Netflix; I've given you the trailer here as motivation. If you have the time, click here to listen to the taping of Judy Garland singing the song in the film. You'll be humming it before you know it. One of the best parts of these old horse movies is the chance to see the old vehicles used to transport the horses, including the fake open-window trailer in this clip. I always watch what's going on in the background more than what's going on in the foreground. The New York Thruway and the Northway would be a much more interesting ride today if those neat old styles were still in use. This drawing from Popular Mechanics in 1924 shows a state-of-the-art over-the-road racehorse van...complete with a flagpole. The article with it said that it could reach and maintain a speed of 50 miles per hour, which was something for the day. that makes you feel like a giant magnet has caught on all the horseshoes of all the best racehorses in the world and is pulling them up the Northway to Exit 14. And not a single horse is resisting the pull of that magnet. A trip to Saratoga in August is good for us all. I'm willing to bet on that. 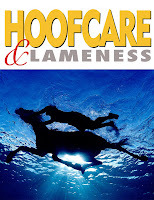 Join Hoofcare & Lameness on Tuesdays in August in Saratoga Springs at the Parting Glass Pub and Restaurant back room, 40 Lake Avenue, for educational lectures and information about hoof-related care of horses. "Saratoga Safe + Sound" will bring together farriers, veterinarians, trainers, and interesting people from all corners of the horse world (literally) in a casual setting. CLICK HERE for more information or call 978 281 3222; email saratoga@hoofcare.com. Double-click on the image to view or print it full-size. That's Kentucky equine therapist Dianne Volz working on the hooves of a well-known stakes horse at Saratoga's Oklahoma training track. 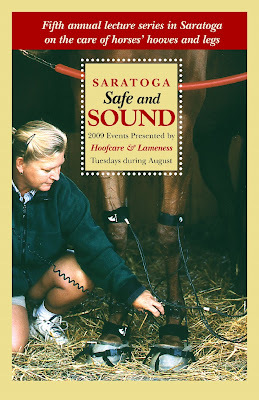 What: “Saratoga: Safe & Sound”; 5th Annual Hoofcare@Saratoga Events hosted by Hoofcare & Lameness Journal, The Hoof Blog, and Fran Jurga. Who: Horsecare professionals, horse owners, blog readers, racing community, press; all are welcome. Note: Our primary speakers are booked but we will be adding more as people confirm what days they will be in Saratoga to work on horses or conduct other business. Watch for updates. Week 1: AUGUST 4: "BUILD A BETTER...HORSESHOE" National Museum of Racing, 191 Union Avene, 6-8 pm. "Ride On!" Special Exhibit on farrier/veterinary advances to help horses reception sponsored by LIFE DATA LABS. You'll meet special guests whose shoes and boots and photographs are featured in the exhibit; with the help of Stonestreet Stables, we hope to donate one of Curlin's shoes to the museum. Main speaker: Dr Michael Steward from Oklahoma on his unique Steward Clog system for laminitis (which is featured by the museum); his lecture will commence at the Parting Glass after 8 pm. He is a down-to-earth speaker who makes sense of a difficult subject and will inspire you to keep trying to help horses. Week 2: AUGUST 11: "BUILD A BETTER...HORSE!" Dr Scott Morrison of Rood and Riddle Equine Hospital, Lexington KY will anchor an all-star evening on foal/yearling problems and no doubt a lot more. Plus: David Hinton, rescheduled for his observations on shoeing for top stakes horses like Curlin and Rachel Alexandra. This is a busy night in Saratoga as the yearling sales will be going on. Week 3: AUGUST 18: "BUILD A BETTER...HOOF!" --2 events. Mike Wildenstein FWCF (Hons) Cornell University College of Veterinary Medicine afternoon for farriers at Skidmore Equestrian Center, 145 Daniels Road. Sponsored by VIBRAM hoof pads. The exact time in the afternoon will be announced soon. Evening program of talks and PowerPoint will be at the Parting Glass. Special guest: Virginia’s Travis Burns from Forging Ahead farrier practice on hoof support alternatives in addition to Mike. Week 4: August 25: (plans in progress) Origins of the Modern Horseshoe Tour of Burden Iron Works Museum horseshoe factory in Troy, NY at 2 p.m. This is a very special event! Evening program at the Parting Glass is tentative because of Bruce Springsteen's concert on the south side of town, but if traffic is routed to not clog up downtown Saratoga, we should be able to proceed. I am currently seeking advice about this, as it is Travers Week and should be the grand finale of the series. Stay tuned for finalized plans for that night;the daytime plans will not be affected by the concert. All sessions are free of charge but come early to get a good seat. Parting Glass sessions start at 7 pm except August 4th, which follows the Museum program. The Parting Glass will serve dinner before or after the session in the function room or main dining room. You can order from the menu and the food is great! Some parking is available behind the restaurant but otherwise parking should be available on side streets without too far a hike. HOTEL INFORMATION: Hotels in Saratoga are very expensive. Hoofcare has a block of rooms at the Comfort Inn & Suites Saratoga Springs on the NY Thruway at Exit 15 (3rd Saratoga Springs exit going north) at a special discount rate of $159 plus tax (breakfast included) and pets are allowed for $10 each. This rate is for Tuesday only and for seminar attendees only. This hotel is a three mile drive from the Parting Glass and close to the racetrack. To book a room: You need to request the Hoofcare rate when booking your room, call a week in advance for all events except August 4th (reservations will be taken up to August 3rd) and you must call the hotel directly at 518 587 6244 and press "0" for the operator to reach the front desk and book with the person on duty. Do not book through "reservations" as they do not have the special rate information. This rate is only for Tuesday and only for Hoofcare@Saratoga attendees. More details will always be posted at www.hoofcare.blogspot.com. Email questions to fran@hoofcare.com or call 978 281 3222. But don't call on a Tuesday. Please forward this information to anyone you think may be interested. "After discussions with industry participants and a review of all scientific research available on the use of toe grabs on the front shoes of Thoroughbreds, The Jockey Club Thoroughbred Safety Committee recommends adjusting the current RCI Model Rule on horse shoes to allow toe grabs up to 4 mm in height on front shoes on dirt racing surfaces only. "The Thoroughbred Safety Committee believes the current elimination of traction devices on front shoes should be maintained and only the height of the toe grab should be adjusted in the Model Rule. "In no case does the Thoroughbred Safety Committee recommend the use of toe grabs of greater than 4 mm on front shoes of Thoroughbreds. "The Thoroughbred Safety Committee continues to believe that the recommendation limiting traction devices on front shoes of Thoroughbreds to toe grabs no greater than 2 mm is in the best interests of the welfare and safety of the horse. "However, the Thoroughbred Safety Committee is sensitive to the concerns of the horsemen and recognizes that local circumstances such as dirt track composition and/or weather conditions might justify the racing commission and/or the racetrack to allow horsemen the discretion to utilize short toe grabs no greater than 4 mm on the front shoes of Thoroughbreds on dirt racing surfaces only." The Hoof Blog will continue to keep readers updated on shoeing rule recommendations and changes as well as research that may affect decision-making about horse equipment. 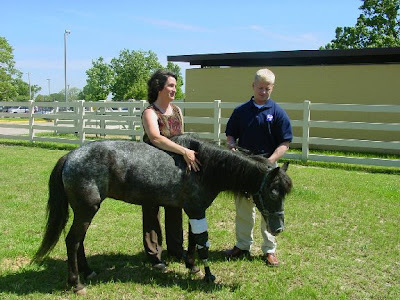 Hurricane Katrina survivor Molly the Pony with her owner/rescuer Kaye Harris and surgeon/hero Dr. Rustin Moore in 2006 after Molly's amputation surgery in Louisiana. Molly will travel to Ohio in August for a reunion with Dr. Moore...and you're invited! At the event you will meet Dr. Rustin Moore. He is the Bud and Marilyn Jenne Professor and Chair of the Department of Veterinary Clinical Sciences at The Ohio State University College of Veterinary Medicine. Dr. Moore was the surgeon who performed the amputation on Molly's right front leg while he was director of the Equine Health Studies Program at the Louisiana State University School of Veterinary Medicine during and after Hurricane Katrina in 2005. Dr. Moore will give a brief presentation, “It’s All About Molly,” at 5 p.m. and again at 7 p.m. in the Wexner Auditorium located in the VMAB; light refreshments will be available near the auditorium in the Hummel Grand Lounge. Molly will be available on the lawn outside of the building for visitors to have the opportunity to meet her and her owner, Kaye Harris, before and after Dr. Moore’s presentation. ABOUT MOLLY - Molly the Pony was rescued by Kaye and Glenn Harris after Hurricane Katrina. Unfortunately, several months later she was injured by a dog that was also a Katrina rescue. Although her other numerous wounds healed, her lower right front leg was too severely damaged. Her rescuer and now owner, Kaye Harris, advocated for Molly, inquiring about amputation and a prosthesis. Please forward this to anyone you think would enjoy this unique opportunity! Please RSVP to Katie Kostyo (kostyo.1@osu.edu) or 614-688-8433, by August 3rd and indicate the number of people who will attend. From SR315, exit at Lane Avenue and head east. Turn right (south) on Fyffe Road. At the next light, turn left on Woody Hayes Drive and then take a right on Coffey Road; follow Coffey to the Veterinary Medicine Academic Building. Free parking is available during the event in the lot just north of the building (east of the Veterinary Hospital). Guests DO NOT need a pass during the event hours. Click here to see Molly's segment on CBS Evening News with Katie Couric. Click here to read about Molly in the New York Times. Click here to read the original Hoof Blog article about Molly and her book. The Hoof Blog has received an announcement from the Guild of Professional Farriers that an unusual special election was held on July 13 and an entire new slate of officers is now in place at the head of that organization. The new officers are Ronald E. Kramedjian, President; Jeff Holder, Vice President; Russ Vanderlei, Secretary; and Rick Burten, Treasurer. Tom Bloomer, who was serving as president until July 13, becomes Past President. The Guild was formed in 1996 in an effort to provide an organization for full-time professional farriers. The organization runs a certification testing program and has been pro-active in the media as a voice on farrier-related issues. 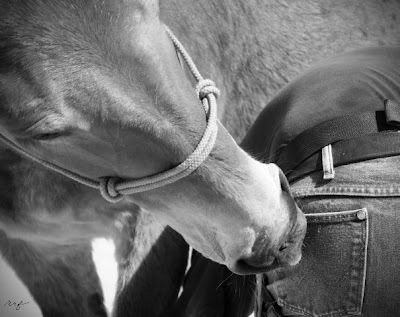 The Guild has a code of ethics for farriers to follow when working with veterinarians. 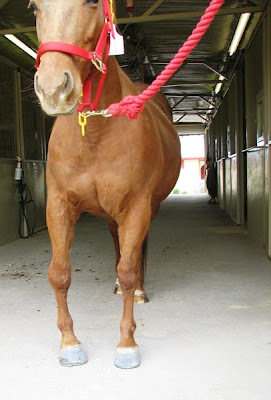 In 2002, the Guild made national news by warning horse owners to question the Strasser method of barefoot trimming, suggesting that it involved radical trimming methods and might cause lameness for their horses. In 1997, Henry Heymering was elected the first president of the Guild. North Carolina's David Millwater was the first secretary and served from 1996 to 2000. When contacted today about the mid-year changes in Guild leadership, Heymering had no comment. In the announcement, the new officers thanked the officers leaving service for their commitment and past service. "Their dedication and commitment to the Guild has helped us to get to where we are," the new officers said. Information about the Guild is available at www.guildfarriers.org. Today, we'll go along with KQED, the National Public Radio station in San Francisco, as they cross the bridge and leave the city behind. Their destination is the vet school hospital at the University of California at Davis. Amy Standen, the intrepid reporter, doesn't usually set up her sound equipment in a horse barn, but she gamely accepts a warmblood with the assumed name of Disney (to protect his real identity) as her subject for the day. The goal is to portray advances in equine stem cell treatments for tendon injuries, using bone marrow or fat tissue stem cells, as promising experiments for future human treatments. Have a listen! Thanks to KQED for setting up this shared audio file. Click here to go to the home page of Quest, KQED's science program, which produced the equine stem cell segment, where you will find photos and the reporter's notes. It was 106 degrees in Texas the other day as Dr Britt Conklin drove down the highway. He'd left home at 2:30 that morning to try to get some horses shod before the heat became too overwhelming. There's nothing quite like the inside of a truck with good air conditioning on a hot Texas day. Dr. Conklin and I were talking his upcoming lecture on Monday, July 20 at the AAEP Focus on the Foot meeting in Columbus, Ohio. Dr. Conklin will leave the heat of Texas far behind and turn his attention to sharing his considerable expertise with the assembled vets and farriers. His topic is "Therapeutic Shoeing: A Veterinarian's Perspective", and he hopes to help vets get beyond the formulaic approach to a lameness problem. He agrees that a specific shoe design does not fix a given problem in all horses. "Vets get bogged down by the appliance. I'd like them to see the approach, first," he said. "All therapeutic shoeing can really do is apply or relieve leverage, tension, and pressure in three planes. And it can provide protection. But it can certainly make you think...and vets need to learn to think through what is wrong and what can be done for that particular horse." Dr. Conklin is a certified farrier and co-owner of Reata Equine Hospital in Weaterford, Texas, where he opened a 3000 square foot podiatry clinic in 2008. He worked as a farrier to put himself through undergraduate school at Texas Tech University and attended veterinary school at Texas A & M University. While at A&M, he apprenticed under Danny Taylor CJF, PhD, who in turn worked with Dr. David Hood on "The Hoof Project"; Taylor earned his PhD for his research in the biomechanics of the equine foot’s digital cushion. Dr. Conklin has deep case files to reference but this one has always stuck in my mind. It has been reported here, and published in scientific journals, that elephants have limited gaits. Research tells us that they can't run, or even trot, and they can only accelerate their walk, according to research conducted at the Motion and Structure Laboratory at the Royal College of Veterinary Medicine in England. "Poor elephants," I always thought. Stuck in a four-beat walk their entire lives. But I think those researchers should take a look at this video. It never fails to make me smile...and to want to go for a swim. Maybe elephants have some secrets that they keep to themselves. If this is a four-beat gait, it's done with such obvious enjoyment. Elephant lovers: Click here for another favorite video, the elephant on a trampoline. Elephants have all the fun! Farrier Steven Beane of North Yorkshire, England, won the World Championship at Calgary this week. 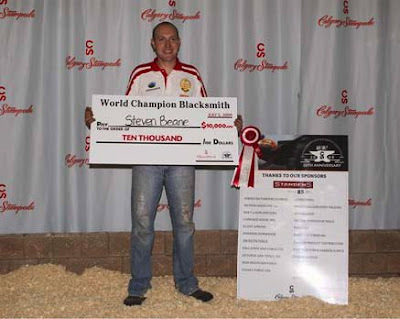 English farrier Steven Beane outdueled his countryman Darren Bazin in 2009’s final of the Calgary Stampede’s 30th anniversary World Championship Blacksmiths’ Competition. Steven earned his first career global title in the process after two previous close calls under the Stampede Big Top. Beane, who was the Calgary runner-up, or reserve champion, in 2005 and ’06, took home first prize of $10,000, a limited-edition bronze trophy, and a handcrafted gold-and-silver Stampede championship buckle. Beane had trailed Bazin, a two-time WCBC winner, by seven points entering Sunday’s five-man final, but stoked up a fantastic finish, finishing with 153 points to Bazin’s 141. England’s Derek Gardner was third with 118 points; Welshman Grant Moon was fourth with 109 points; and Canada’s Iain Ritchie finished fifth at 88. Point totals for all competitors reflected three days’ work in front of the forge. Roughly 25 first-time competitors made the trip to Calgary, after winning national competitions in their home countries. A large number of past champions and runners-up made the trip because it was the 30th anniversary, making this one of the most impressive fields ever contested at the Calgary Stampede. Other class winners were Gene Leiser of Texas USA in a forging class, and in the artistic division, Mike Chisham of California USA, Stephane Demartinprey of France (I think), and John Steel of Pennsylvania. Ben Casserly of England won the rookie award. (Thanks to the Calgary Stampede for this photo and the results information.) Congratulations, Steven! They are the Affirmed and Alydar of the sport horse world. Venus and Serena on horseback. One wins one day for technical perfection. The other wins the next day for taking risks on a horse that seems barely under control...and yet delivers in artistic superlatives. A single hoofprint out of line often is all that separates the two. When Germany's top dressage star Isabell Werth was suspended last week for a positive medication test on her lower level horse, her arch-rival Anky Van Grunsven of Holland did not shout with glee that her rival would not be at the World Equestrian Festival in Aachen this weekend to oppose her. "I am not a supporter of doping at all but I want to do what is best for the horse. "An example: when I want to clip my horse before a show, I would like to give him a light sedation to relax because my horse is a bit afraid of the clipping machine. The stuff we use to relax the horse is doping positive. Imagine, I asked the vet how many days before the show I can clip my horse and he says three days. But what if it is found in my horse’s blood at the show five days after I used it? That means my horse is doping positive! But I think it’s for the horse benefit to clip him. "I think the rules have to be changed. The research regarding doping is very expensive but it will be a good idea to work with a logbook and write down what had been given and why. "If the medication is not to improve the performance, I think there is no reason to maintain the zero tolerance for these cases." Click here to watch the video. It's in Dutch but has some nice footage. Note: in another poignant twist of fate, Anky did not win at Aachen this weekend. That honor went to the American, Steffen Peters, on Ravel. One can only wonder what might have happened if Isabell had been allowed to compete. Click here to follow Fran Jurga and The Hoof Blog on Twitter! Happy Fourth of July to all the Hoof Blog's USA readers! Illustration: "American Cincinnatus 1783" appeared on the cover of Literary Digest on March 21, 1931; it later appeared several times on the cover of the Horseshoers Journal, also in the 1930s. Jean Leon Gerome Ferris was an American painter who created a series of 78 paintings called "An American Pageant". He died before this painting was publishing on the magazine covers. Perhaps that is why this painting is not very well known. It's terrific! The sport horse world was shocked last week to learn that Olympic Gold Medalist Isabel Werth of Germany has been provisionally suspended from competition for a doping violation and now faces up to two years' suspension. Werth issued a press statement (below) which states that she administered the banned anti-psychotic substance not as a sedative but as a treatment for the horse's shivers condition. She had believed that all traces of the medication would have left the horse's system before the competition but that was not the case. Shivers is a difficult to treat condition seen usually in warmblood sport horses and draft horses. It is often confused with stringhalt, which is a completely different condition, and has been studied at the University of Minnesota by Dr. Stephanie Valberg. Farriers are extremely familiar with shivers, as the horse has difficulty balancing itself on three legs. Shoeing or trimming can be dangerous for the farrier and the horse. Click here to read an article previously published on the Hoof Blog about shivers, with an illustration. 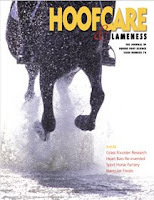 An excellent article by Dr Beth Valentine in Hoofcare & Lameness #75 is also a good resource. Yesterday I was informed by the FN (German Equestrian Federation) that during a medication test on May 30, 2009 at the CDI in Wiesbaden, traces of the substance FLUPHENAZINE were found in a sample taken from my small tour horse Whisper. Therefore I feel the need to inform the public personally – in addition to today's FN press release – about the background of this matter. Whisper suffers from the so-called SHIVERING SYNDROME. 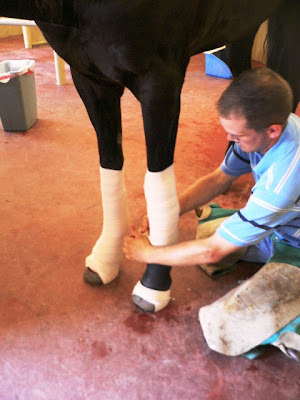 This affects the central nervous system and causes imbalances if the horse has to stand on three legs for a longer while – for example when being groomed, bandaged or shod. Feeling insecure, the horse begins to shiver and lunges uncontrollably for fear of losing its balance and keeling over. This illness is not painful and does not influence a horse's ability to compete, but it entails an increased risk for the persons working with the horse (farrier, groom, rider). Therefore I asked my veterinarian Dr. Hans Stihl (SUI), if and how this Shivering Syndrome can be treated. Dr. Stihl explained to me that so far there is no cure for this ailment, but that several horses in his care had showed positive reactions to a drug called MODECATE. This drug contains FLUPHENAZINE as an active substance. So we treated Whisper once, on May 16, 2009, with this drug, in order to find out if he responds to it. This was the case, the shivering was reduced, and there was less uncontrolled movement when we raised one of his legs. When asked for the settling time, Dr. Stihl told me that according to his experience, six days are enough, but one could never be completely sure. So, to be on the safe side, we decided to let Whisper compete again on May 30, 2009 in Wiesbaden. I took this decision to the best of my knowledge. In spite of this, the FEI doping lab has now found traces of said substance. One reason may be that the lab has used new analyzing methods. The FEI has suspended me immediately, as dictated by the rules of procedure. The fact that only ineffective traces of the drug were found does not matter according to those rules. I deeply regret this incident, but I was convinced that I had acted correctly. I wish the rules were revised as quickly as possible in a way that allows reasonable treatment of sport horses without risking long suspensions because the settling times change constantly with each new method of analysis and become literally “incalculable”. I am aware that I have given reason to doubt the honesty and cleanness of my person and of our sport. I herewith apologize to everyone who is close to me and to equestrian sports. Of course I will do everything to help clarifying any questions that still remain. 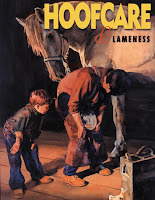 Click here to follow Fran Jurga and the Hoofcare & Lameness newstream on Twitter.